Christy, over at Superheroes and Princesses, got us thinking about Tyrannosaurus Rex, with her review of Natalie Lunis' A T. Rex Named Sue, Sue Hendrickson's Huge Discovery. 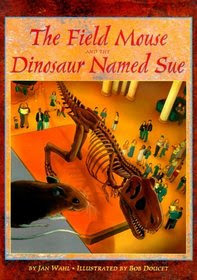 Our library didn't have that book, but it did have several others about Tyrannosaurus Sue. The Field Mouse and the Dinosaur Named Sue is a fictional story, for younger children, of a mouse, that tagged along with the fossil from its South Dakota home to The Field Museum in Chicago, where it resides now. ...and A Dinosaur Named Sue The Story of the colossal Fossil, The World's Most Complete Fossil by Pat Relf, aimed at older children, are non-fiction, or at least partially non-fiction (depending on your point of view), accounts of the finding, digging, and restoring, after a lengthy legal battle over ownership, of the most complete fossilized T-Rex skeleton found to date. They are written from an evolutionary viewpoint, but hint enough at a world-wide flood, to keep most creationists happy, too. Tyrannosaurus Sue, like her friend T-Rex Stan, was found in the Hell Creek Formation in South Dakota. It's part of the same geological formation, that runs through eastern Montana, and is home to T-Rex Jane and Bob - also known as B. Rex, which is good, because "he" turned out to be a "she". All of them have interesting, and unique stories, though Sue is the only one who seems to have rated any children's books. We also learned, that Montana is home to one of the two T-Rex footprints found so far. Of course, a discovery like that deserves a cookie, and naturally we made a batch. You can click here, for the sugar cookie dough recipe, and then follow the pictures below, if you'd like to make some, too. Or, click over to Mouse Grows, Mouse Learns' What My Child is Reading link-up, to find out what other families have been reading this week. When we study Illinois, I'll need to see if my library has any of these books. We will be starting a dinosaur unit in August...we will def try these out! And I'll have to look into those Sue books as well! TFS! I LOVE your cookies! I'm going to see if we can find these books and I'll just have to make your cookies too! Great book choices and very interesting cookies. I have to look for those T-Rex books as my daughter continues to be fascinated with dinosaurs. What My Child is Reading - Summer is Here! Making a Butterfly Net is Easy, Science is Hard. Pop Bottle Bird Feeder Success!